As we entered our final day in Vancouver, we were faced with a decision to make about what we should see. Since we had come to North Vancouver specifically for attractions there, it made sense to stay local and so we could rule out places like Science World which are in Vancouver itself. We could go to Whistler or Squamish, but without a car getting there would be difficult and Whistler would be worth an overnight stop anyway. We could go to Lonsdale Quay Market, but having done two markets recently (in Seattle and Granville Island) we weren’t sure it was the best use of our time, especially when reviews were so-so. Deep Cove was also an option, but perhaps that was best seen on a sunny and warm day from a kayak. So that left us with a choice between Lighthouse Park and Cypress Provincial Park. We plumped for Lighthouse Park as the public transport there was far more realistic, although it still required 3 buses to get there. Fortunately the bus service and fare system in Vancouver is excellent so in theory this shouldn’t be much of a problem. However, the risk always with making that number of connections is that you could miss a bus if your previous bus is slightly delayed. This happened to us, and in need of some change for our bus the next day when we would land in Toronto, we used the time to buy a Caramilk, which is Cadbury’s Canadian version of Caramel. Caramel wins by the way. 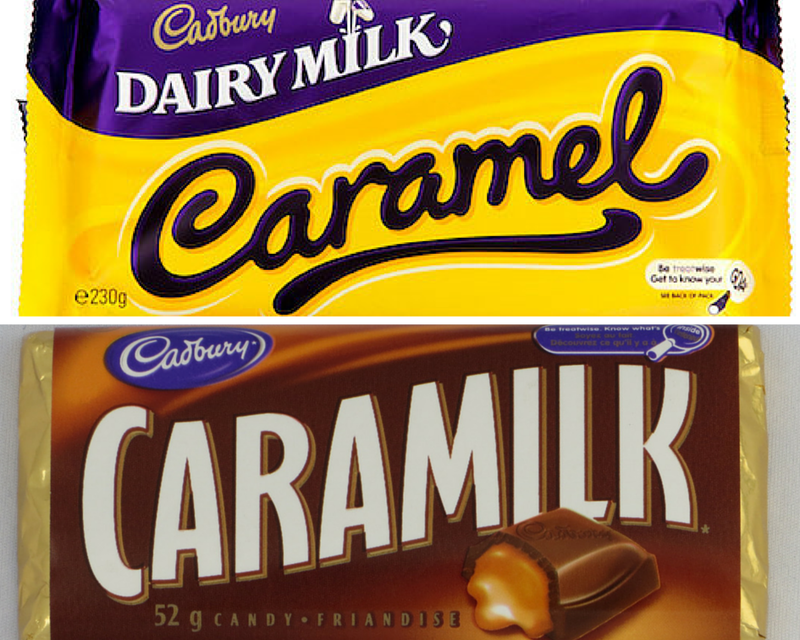 The UK’s Caramel trumps Canada’s Caramilk. Even the British packaging is superior! After a 5 minute walk from the bus stop on the main road, you reach the Lighthouse Park car park. Here you can pick up a guide to the park, which includes a map of all the trails that fan out from the park’s main entrance off the car park. This is a relatively small park by North Vancouver standards, and many of the trails looked like they would be lovely and scenic as we passed their various start points. However, it had been raining heavily all day – it was probably the heaviest rain we had experienced during our time in Vancouver! Emma in particular was in no mood for hanging around and walking any further than we needed! So we beat a path straight to the Point Atkinson lighthouse (yes, that is where the park gets its name from!). 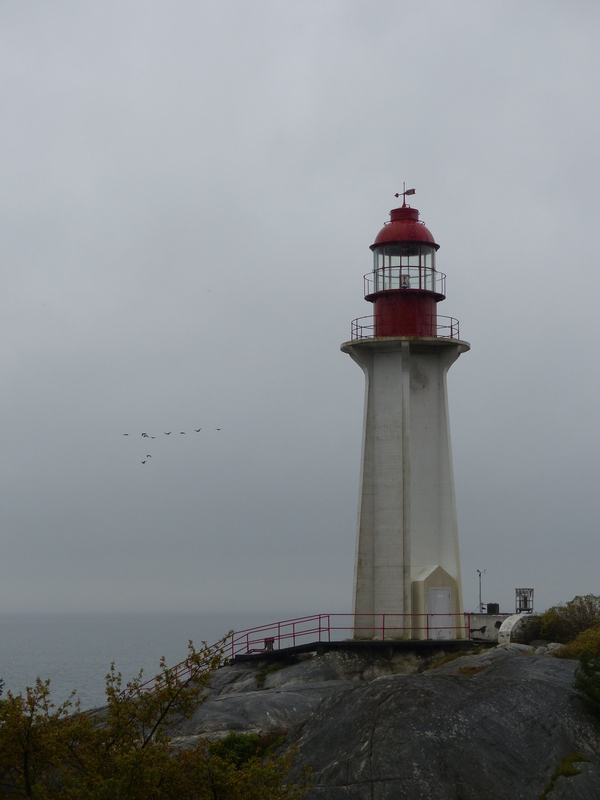 We took in views from three areas – down near the water, from as close to the lighthouse as we could get, and finally from a point overlooking the lighthouse. 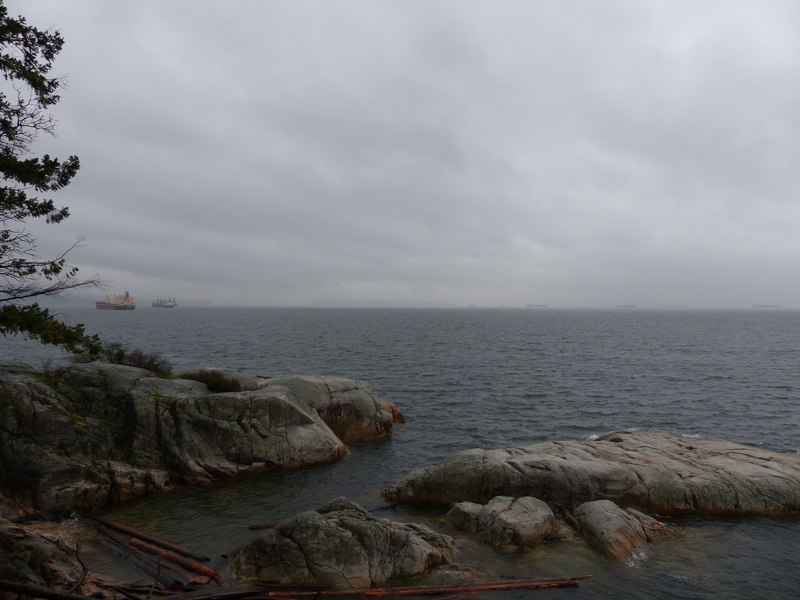 The views from here on a good day have the potential to be spectacular, however the weather was so foul on this day that all we could see was grey, with Stanley Park and the Lion’s Gate Bridge the faintest of silhouettes 7 miles off to the east. To compound matters, there was no shelter or anywhere dry for us to eat the packed lunch that we had brought! By the time we left, we were hungry and wet, and then had to run down the road after our first bus momentarily drove past us, before waiting half an hour for our second bus and then sharing it with a load of annoying school kids! So what’s the moral of this story? 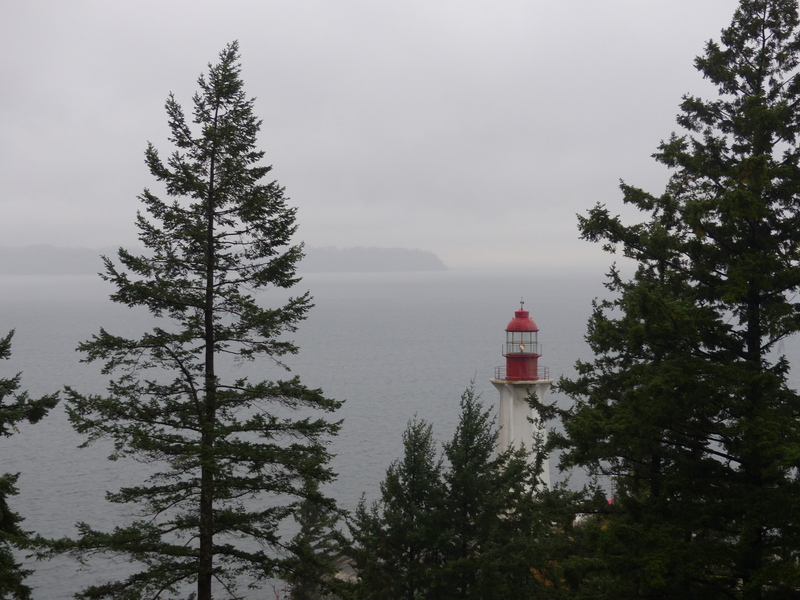 By all means, if you are in the Vancouver area, pay Lighthouse Park a visit. But we’d recommend that you drive there. At least then you don’t have to wait for buses in the rain and you have somewhere dry to eat your lunch. Oh, and pack a Caramel in that lunchbox, not a Caramilk.